Multiple myeloma is one of several diseases that are collectively known as plasma cell dyscrasias. In general, the term myeloma refers to cancer of special types of white blood cells called plasma cells. Plasma cells are important components of the immune system that help the body fight infections caused by microorganisms such as bacteria, viruses, and fungi. Plasma cells are found primarily in the bone marrow and develop from white blood cells called B-lymphocytes. When microorganisms invade the body, B-lymphocytes respond by transforming into plasma cells which, in turn, produce proteins called antibodies that help to destroy the invading microorganisms and, thereby, eradicate the infection. There are five types (classes) of antibodies (immunoglobulins) produced by plasma cells: IgG, IgM, IgA, IgD, and IgE. Each plasma cell produces a specific class of antibodies. Under normal conditions, the body only produces plasma cells when they are needed to help fight off infections. Once the infection has been eliminated from the body, the old plasma cells die off. Certain genetic mutations can cause plasma cells to become abnormal and continue to divide over and over again and, eventually, form a tumor. These abnormal plasma cells, called myeloma cells are cancer cells that produce a specific type of antibody (monoclonal antibody) called M proteins. The monoclonal antibody that is typically overproduced by the myeloma cells is usually of the IgG or IgA variety. Most commonly, a whole monoclonal antibody is produced, however, in about 20% of cases, only a partial antibody called a light chain is produced by the myeloma cells. Light chains do not remain in the circulation and are found mainly in the urine. The M proteins in patients with multiple myeloma can be detected in the blood and/or urine by specialized techniques known as protein electrophoresis and immunofixation. Since plasma cells originate from the bone marrow, when plasma cells grow out of control, become abnormal myeloma cells, and produce tumors, the tumors usually develop in the bone marrow. If only a single tumor is present, it is called a solitary plasmacytoma. Typically, however, several tumors can be found throughout the bone marrow and, in these cases, the condition is called multiple myeloma. Anemia - an abnormally low number of red blood cells in the bloodstream that can cause severe fatigue and weakness. Thrombocytopenia - an abnormally low number of platelets in the circulation that can lead to bleeding and/or bruising problems. Leukopenia - an abnormally low number of white blood cells in the circulation that increases the risk for developing severe, life-threatening infections. Myeloma bone disease - myeloma cells produce a variety of substances (mediators) that stimulate cells called osteoclasts to resorb (dissolve) bone at a much faster rate than cells called osteoblasts can produce new bone. This increased rate of bone resorption in patients with myeloma can cause weak, brittle bones (osteoporosis) and, thereby, increase the risk for developing fractures. If you or a loved one has been diagnosed with multiple myeloma, it's critical to learn everything you possibly can about this condition so that you can make informed decisions about your treatment. That's why we created the Medifocus Guidebook on Multiple Myeloma, a comprehensive 165 page patient Guidebook that contains vital information about multiple myeloma that you won't find anywhere in a single source. The theories regarding the underlying causes of multiple myeloma. The risk factors that can increase a person's chances for developing multiple myeloma. The signs and symptoms that may be associated with multiple myeloma. Other underlying conditions that may be confused with multiple myeloma because they produce similar signs/symptoms and must be considered in the differential diagnosis of multiple myeloma. The major and minor diagnostic criteria that serve as the basis for confirming the diagnosis of multiple myeloma. Which patients with multiple myeloma are candidates for an approach known as "watchful waiting", where the progress of the disease is monitored carefully but no specific treatment is required. The role of stem cell transplantation in the management of patients with multiple myeloma, including the risks and benefits of this procedure. The treatment options available to patients with multiple myeloma who experience a relapse or recurrence of the disease after initially having gone into remission. The role of plasmapharesis - the direct removal of abnormal antibody proteins from the bloodstream - in the management of patients with multiple myeloma. A detailed overview of the risk of infections in people with multiple myeloma, including practical recommendations for reducing the risks of developing potentially life-threatening bacterial, viral, and fungal infections. The treatment options that are available for the management of patients with multiple myeloma who develop myeloma bone disease - areas of bone destruction caused by multiple myeloma that significantly increase the risk of developing pathologic fractures. The prognosis (outlook) for people with multiple myeloma and important prognostic factors that have a significant impact in predicting the overall chances of recovery and survival. The role of complementary and alternative therapies in the management of people with multiple myeloma. Quality of life issues such as sleep disorders, fatigue, weight loss, and psychological stress that often confront people with multiple myeloma and tips for how to minimize their impact and better cope with these important issues. Important questions to ask your doctor about multiple myeloma. A Guide to Recent Medical Literature on Multiple Myeloma - This section of the Guidebook contains an extensive bibliography of over 100 references to recently published articles about Multiple Myeloma in authoritative, peer-reviewed medical journals with links to the absracts (summaries) of the articles. These articles represent the latest advances in the field and focus on cutting-edge research, new developments, and the lessons learned from recently published clinical trials involving patients with Multiple Myeloma. This is the same level of that is used by doctors who treat people with Multiple Myeloma to keep abreast of the latest developments and breakthroughs in this specialized field of medicine. Centers of Research for Multiple Myeloma - We've compiled a unique directory of doctors, hospitals, medical centers, and research institutions with special interest and, in many cases, clinical expertise in managing people with Multiple Myeloma. The "Centers of Research" directory is a valuable resource for quickly identifying and locating leading medical authorities and medical institutions both within the United States and other countries who are considered to be at the forefront in clinical research and treatment of Multiple Myeloma. You'd have to spend days - or even weeks - attempting to compile your own list of doctors and medical centers but, with the "Centers of Research" directory, the information is already right at your fingertips. All you have to do is act on the information by selecting and contacting the experts or medical institutions listed in the directory by state and country. Organizations and Support Groups for Multiple Myeloma - The Guidebook also includes a directory of organizations and support groups whose goal is to help people with Multiple Myeloma by providing access to information, resources, and services. Many of these organizations can answer your specific questions, enable you to "network" with other patients, and provide guidance in areas such as financial, social, or medical-legal issues. This valuable directory of organizations and support groups includes complete contact information, including phone numbers and E-mail addresses. 20% Discount - For a limited time, you can purchase the Medifocus Guidebook on Multiple Myeloma at a special 20% discount off the regular list price. Your 20% discount will automatically be applied when you go to "Checkout". 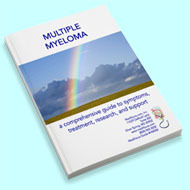 Order Your Copy of the Medifocus Guidebook on Multiple Myeloma Today! The Medifocus Guidebook on Multiple Myeloma is available in the following two convenient formats: Printed and Digital. "The information in your MediFocus Guidebook on Multiple Myeloma was extremely useful. Thank you for providing this service." "I purchased the MediFocus Guidebook on Multiple Myeloma for my mother and it was a great help because it helped us to understand more about the disease, the causes, and the treatment options. Although there is no cure, it has helped us cope with the situation and helped us figure out how we can live with the disease." "My oncologist borrowed my copy of the MediFocus Guidebook on Multiple Myeloma and found it very useful in his work. He intends to contact your office."